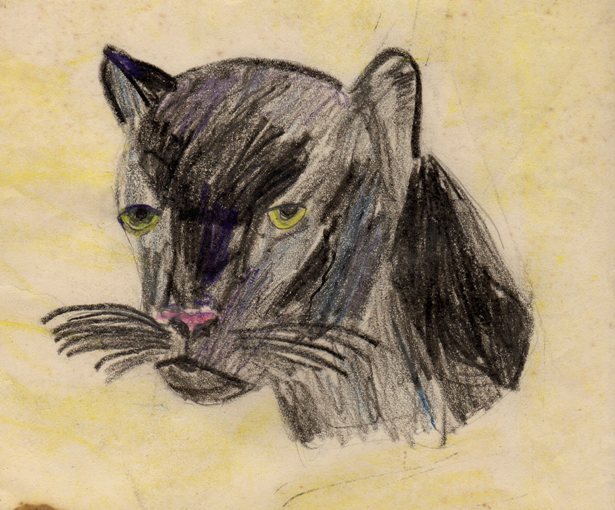 This entry was posted in Art Break Wednesday and tagged art, Art Break Wednesday, block prints, childhood art, printmaking, relief prints, spooky art by artsyletters. Bookmark the permalink. I love that pot, Robyn! I think my favorite of your three is definitely Gorey. I love all that he presents, & keep finding some old books I didn’t know. Happy Halloween! Edward Gorey’s art is deliciously dark and funny at the same time. It’s high time there was a retrospective of his work published. He, like Charles Adams, was a master of black humor. His illustrated version of FRANKENSTEIN is an absolute masterpiece! Oooohh, thanks for that link, Scott. That is some deliciously scary stuff. And a Gorey restrospective would be great. Thanks for coming by! 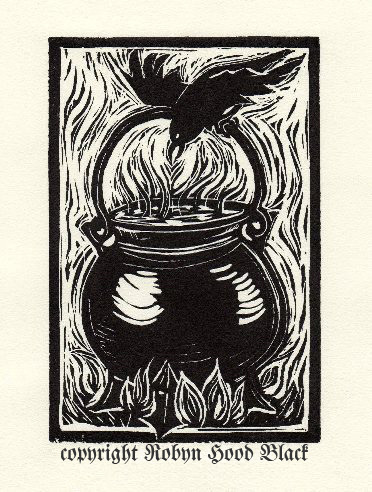 Oh, there’s that cauldron relief print I love so much — and “Spooky Brew” is just the poem for today! Interesting about both you and your brother being afraid of the letter Y. I always thought X was scarier. I do like Gorey’s work, and more recently, Tony DiTerlizzi’s interpretation of “The Spider and the Fly.” Magnificence in black and white! Happy Halloweeen, Jama! Thanks for visiting. Tony DiTerlizzi – how could I forget Tony DiTerlizzi? Will add to the links above. There are some clever rhymes in your poem. I liked seeing your early artwork. Have a happy and safe Halloween, Robyn. You too, Patricia! Thanks for stopping by. Happy Halloween Robyn! This is a great post for today, thank you. I love the way you signed your cauldron print, perfect font. I must say Gorey is one of my all time favorites. I saw a show at the Orlando Museum of Art about him, it included some of his handwritten letters and decorated envelopes…a great exhibit. Hi, Beth! Oh, I wish I’d seen that exhibit. Thanks for sharing. I took Seth to see the Norman Rockwell exhibit there a few years ago – fantatstic. Believe it or not I’m a font geek too. Sometimes the name doesn’t really go with the font – you’d think “Akzidenz Grotesk” would be something menacing but it’s actually a pleasant and timeless sans-serif typeface family (almost 120 years old!) that was the inspiration for Helvetica (1957) and is the corporate font for McDonalds, Nissan USA, NBC Nightly News captions, and the American Red Cross, not to mention one of the three go-to fonts that every movie seems to use for its titles and posters along with Trajan (historical epics like “Troy” and “Titanic”) and Bank Gothic (sci-fi and action movies like “The Day After Tomorrow”). Hey, Bro! Well, anyone reading your comment will know why YOU were the one who headed off the Vanderbilt at age 16. And why I could never win Trivial Pursuit… ;0) Thanks for all of this. A “U”, eh? See, my memory converted it to a “Y”. Love the backstory on the inspiration for Helvetica!